A blog by a marketing company called Futureproof employed to recover the SMA brand from its 3rd place position in the UK market has been receiving attention on social media. It reveals the strategies used to present the company to mothers as a trusted partner so as to boost sales of SMA infant formula. Futureproof claims the strategy moved SMA from 3rd place to 2nd place in the market. Nestle, which completed its takeover of the SMA brand in December 2012, has said the article dates from the time of the previous owner and has had it removed (click here for our archive copy). However, Nestle’s current marketing practices show the world’s largest baby milk company is following the strategies developed – and even more aggressive ones it uses around the world and has imported to the UK. 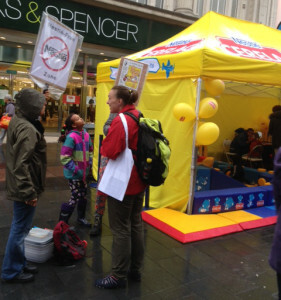 (For example, a street stall and play area used to promote SMA formula and its Cerelac baby food in Leicester in 2015). Although formula marketing regulations in the UK are far weaker than international minimum standards, promotion of formula for use from birth is prohibited. So the marketers came up with other ways to boost sales. SMA needed to deepen the relationship they had with mums, and create a relationship that went beyond the product. They wanted to refresh their long-standing ‘Know-How’ platform with something more relevant. 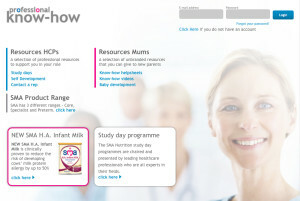 The overall goal was to place SMA as the go-to brand for support and advice whilst showcasing their infant formulas. Got that? The strategy is to be seen as the place to go to for advice, but with the purpose of showcasing products that cannot be advertised. International marketing standards give health workers responsibility for advising parents on infant feeding and companies are restricted to providing scientific and factual information on products to health workers. As we shall see, the information companies give on their products cannot be trusted. Futureproof were briefed to create a deeper relationship between SMA and mums, and take the relationship from ‘necessary product’ to ‘trusted brand and partner’. From our research, we discovered that the main thing that mums wanted was reassurance. Reassurance that at this incredibly tricky, emotional, and daunting time, they were making the right decisions and doing ok. Particularly around the delicate, emotional, and controversial subject of breastfeeding and weaning. Nestle preys on mothers at this “emotional” and “daunting time”, even though targeting pregnant women and new mums is prohibited outright by Article 5.5 of the International Code of Marketing of Breastmilk Substitutes. Nestle is running with the “You’re Doing Great” slogan. It uses on its SMA mums website (as below). 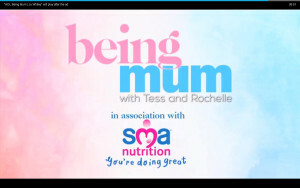 Nestle launched a “You’re Doing Great” SMA advertising campaign on television and on the AOL “Being Mum” online channel, which it sponsors, aiming to target young mothers in particular (the advertisements accompanying the SMA-branded channel were removed after Baby Milk Action exposed these break prohibitions on promoting infant formula brands). What are companies aiming for? The results were outstanding and immediate. Within six months, the brand increased levels of interactivity with mums, and dramatically shifted the perceptions of SMA to a more ‘caring’ and ‘supportive’ space. But perhaps the most encouraging result has been that commercially the brand moved from number three in market to number two within six months, and is now pushing to regain the number one spot. It is all about selling infant formula. Which should come as no surprise. Companies do not target pregnant women and mothers because they want to be helpful – it is to sell more products. The cost of the promotion goes onto the price of the formula. Baby Milk Action calls on companies to respect the rules, stop the promotion and make permanent cuts to the cost of formula: “No promotion – Cheaper formula”. Since Nestle has owned the SMA brand marketing has become more aggressive. Nestle is the world’s largest baby milk company and it will not settle for being second largest in any market. It systematically violates baby food marketing standards around the world (see IBFAN’s Breaking the Rules monitoring reports, available from the International Code Documentation Centre). Nestle recruited a network of Clinical Representatives to promote relaunched SMA products to health workers. Their stated responsibility is to secure “brand endorsement” from health workers. Left: Nestle’s SMA professional know-how website, promoting SMA HA (see: Nestle launches new hypoallergenic formula promotion campaign as BMJ finally retracts fraudulent research that built the market). Many health facilities only allow company representatives to provide information to a designated expert, who assesses it for accuracy and only communicates what is necessary. To bypass this restriction, Nestle organises “study days” at nearby hotels, sometimes with speakers on other topics (such as water birth), to entice health workers so it can promote products to them. In 2013 it launched its New SMA First Infant Milk claiming it to be “closer to breastmilk” (below). In truth, all formulas on the market have to comply with composition requirements and there is no proven benefit from optional ingredients companies make claims about. Price and the preferences of the child are as good reasons as any for choosing a brand. When Pfizer owned the SMA brand, Baby Milk Action won a case at the Advertising Standards Authority proving its claim that it was the “best” follow-on formula could not be substantiated (see: SMA formula NOT “the best milk after Kate’s” ASA ruling finds). 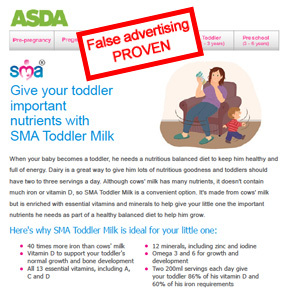 Baby Milk Action won a case against Nestle at the Advertising Standards Authority (ASA) in October 2014, after it made untrue claims for its SMA toddler milk in an ASDA customer email. ASDA refused to send a correction to customers it had misled. Nestle continued to use the false claims on its website, until we brought a second case to the ASA. In 2015, Nestle took to the streets to promote the SMA brand, such as at the Leicester Mela, where health campaigners were on hand to provide information on the rulings against Nestle’s misleading claims and its violations of marketing requirements (picture at top of page). 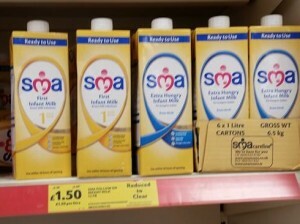 This New SMA Infant Milk that Nestle promoted as the “closest to breastmilk” is currently being sold cut price in special clearance displays in supermarkets such as Tesco. Nestle is launching a new formula, called SMA PRO. In a campaign targeting health workers in January 2016 Nestle explained that babies fed on its current SMA formula are receiving excess protein. Tesco has rolled out promotions across its chain to clear shelves of the current formula. It is not telling customers that the promotion is because the “protein intake in infants is in excess of requirements” and that a new product is being launched. This is not the first time Tesco has promoted infant formula in breach of the law. In another strategy to bypass the restrictions on advertising its formula to the public, Nestle has recruited parenting bloggers to promote the SMA brand. A current campaign is hijacking the public health message about the importance of nutrition during the 1000 days from conception and branding it with SMA. Ironically, the bloggers recruited by Nestle are writing about the importance of protein and sharing Nestle’s SMA-branded video. Nestle wants parents to see it as a “trusted partner” and source of information – and to forget they have been feeding their babies “excessive protein” if using the current SMA product. Nestle is not apologising for the misleading promotion that implied the existing formula was almost the same as breastfeeding. 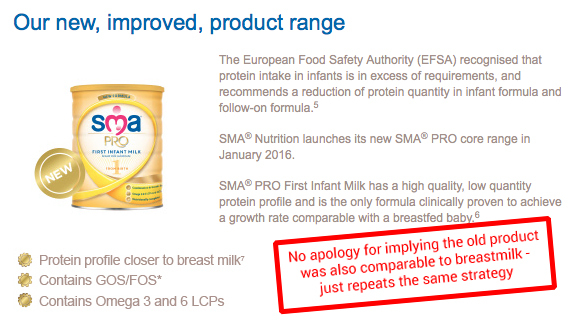 It is promoting its new SMA Pro formula with the same strategy, claiming it has a “protein profile closer to breast milk”. Given the way for the formula industry works, you can expect this formula to be replaced by another “new improved” formula in the next few years. Breastmilk substitutes have been described as “nutritional medicine”. When it comes to other medicines, we look to health workers for independent advice. We do not expect pharmaceutical companies to be “caring” and our “trusted partner”. While we welcome their products being available, we know there is a financial aspect in play and that they seek to increase sales and profits. We would quite rightly be wary if bloggers were profiting from directing readers to pharmaceutical companies rather than independent sources of information for health advice. Infant formula is the sole food for a child under 6-months of age that is not breastfed or receiving breastmilk by other means. It should not be marketed in these manipulative ways. For independent information on the formulas available in the UK, see the guides produced by the First Steps Nutrition Trust. The NHS Guide to Bottle Feeding. Click here for the latest news on Baby Milk Action’s campaign to stop Tesco’s illegal promotion of Nestle SMA infant formula – click here to support our work. Click here for information on the Nestle boycott. And remember those nice people at SMA are just after your money – and the bloggers who send you to them for information are working for them. 6 month + baby. HV indoctrination and basic ignorance flourishing.